I’m delighted to announce three new shows in The Maria, all with strong political themes. Violence underpins our world: how can we manage to live well within it? The incomparable Belarus Free Theatre return with a characteristically poetic but incisive attack on the use of capital punishment in Belarus and other parts of the world. Drawing on real-life experiences from four continents, re-telling them in their unique, now celebrated style, Trash Cuisine is all we expect from BFT – provocation, daring and unforgettable theatre. Betrayal and terror drive Theatre O’s new show inspired by The Secret Agent. Using performance styles from the time when Conrad’s masterpiece was written (expressionism, early film), Joseph Alford’s vibrant young company tell the story of an anarchist cell and a woman’s struggle to rescue her young brother from an involuntary suicide mission. Set in contemporary Scotland, David Greig’s The Events asks: ‘What are the limits of empathy?’ ‘Is it ever possible to understand an extreme act of violence?’ Directed by Ramin Gray and featuring a community choir, it’s an urgent gaze into the deeper waters of human experience. But in the Clare, a wholly different mood as Fevered Sleep return with their ever scintillating Brilliant, a mesmeric show for the very youngest of audiences. Internationally acclaimed and fearlessly inventive Belarus Free Theatre return to the Young Vic with an arresting new production that challenges the use of capital punishment in modern society. Drawn from conversations with executioners, human rights lawyers, inmates and their families and re-told in Belarus Free Theatre’s inimitable style, Trash Cuisine is urgent theatre that pierces the imagination with moments of the darkest humour. In 2013, Belarus is the last country in Europe to still use the death penalty, keeping company with 94 other countries across the world. Banned from performing openly in their home country, Belarus Free Theatre present a hard-hitting new work that weaves together real-life testimonies with extracts of Shakespeare’s tragedies, live music and dance to challenge the justification behind capital punishments continued use. Researched over 5 years, Trash Cuisine shares harrowing stories from Thai and Belarusian executioners, a man who endured decades in prison on false grounds and human rights lawyers who watched their defendants face the electric chair, to build an unforgettable picture of the violence and cruelty authorised by governments across the world. Belarus Free Theatre was founded in 2005 in Europe’s last surviving dictatorship by husband and wife team Natalia Kaliada and Nicolai Khalezin, joined shortly afterwards by Vladimir Shcherban. All company members together with audiences have been arrested, lost their jobs, been forced into hiding or exile for making theatre. Inspired by Joseph Conrad’s classic novel, The Secret Agent is theatre O’s heartbreaking but hilarious chronicle of passion, betrayal and terrorism. In their trademark highly imaginative style, music hall and early cinema collide in theatre O’s return to the stage after 5 years away. The Secret Agent (published 1907) is an early example of the political thriller. It’s the story of a reluctant spy pressured by ‘a foreign power’ to blow up the Greenwich Observatory so as to provoke the UK government into passing repressive legislation. Using early 20th century forms of entertainment, including music hall, magic-lantern and early cinematic techniques, theatre O tell the story at its heart – that of a woman fighting to protect her young brother from exploitation and violence – and find a surprisingly modern tale that resonates as strongly today as it did over a century ago. theatre O is a vehicle for co-artistic directors Joseph Alford and Carolina Valdés to create and tour inspirational, devised inter-disciplinary theatre. Their aim is to make work that inspires, moves and challenges both themselves and the audience. David Greig’s The Events is a vigorous new play about tragedy, obsession and our destructive desire to understand the unfathomable. Directed by Ramin Gray and featuring local choirs and a soaring modern soundtrack, it asks how far forgiveness can stretch in the face of atrocity. At the heart of The Events is Claire, a woman who finds herself caught up in a politically and racially motivated mass murder, which upturns everything she believed about herself and a young man she thought she knew. David Greig’s new drama examines the limits of human empathy and our need to understand extreme acts of violence. David Greig’s recent plays include Midsummer: a play with songs (Soho Theatre and Traverse), Dunsinane (Royal Shakespeare Company at Hampstead Theatre), The Monster in the Hall (Traverse) and The Strange Undoing of Prudencia Hart (Tron and National Theatre of Scotland). He has written the book for the new West End musical Charlie and the Chocolate Factory, directed by Sam Mendes, which opens in June 2013. Actors Touring Company, led by Ramin Gray, presents the best of international contemporary theatre. Recent shows include Wild Swans (co-production with the Young Vic), The Golden Dragon, Crave and Illusions. The Events is an Actors Touring Company, Young Vic, Brageteatret & Schauspielhaus Wien Co-Production. Brilliant – Fevered Sleep’s enchanting show for 3 to 5-year-olds returns to the Young Vic this summer for a limited two-week run. Fevered Sleep are leading innovators in theatre-making and visual arts projects for children and Brilliant is an unforgettable introduction to theatre for young audiences and their families combining movement, live music and captivating imagery. First seen at the Young Vic in 2009, Brilliant is the final part of Fevered Sleep’s trilogy for young audiences which includes Feast Your Eyes and And the Rain Falls Down exploring everyday rituals as extraordinary creative events. It was nominated for the Best Show for Children and Young People TMA award in 2008. Award winning Fevered Sleep uses live music, inventive lighting, movement and rich theatricality to create a dreamlike world made of light. Young Vic associate company Fevered Sleep has an international reputation for devising groundbreaking work that is both playful and profound, through surprising and intimate experiences that encourage people to see the world in new and unexpected ways. Brilliant is recommended for ages 3 to 5. Not suitable for younger children. 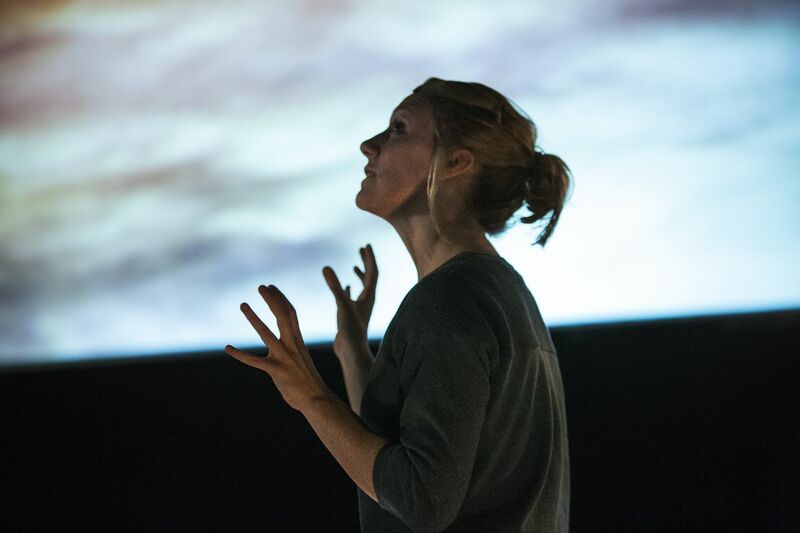 Above Me The Wide Blue Sky arrives at the Young Vic this week after runs in Lancaster and Coventry – creators of the piece Fevered Sleep asked their audiences on tour what they thought. Here’s some of their comments! You can also hear more reactions in this video created by Warwick Arts Centre. Take a look at the beautiful new trailer for Fevered Sleep’s ‘Above Me The Wide Blue Sky’, which starts at the Young Vic on 7 March. Take a look at the poster artwork for the upcoming show by Fevered Sleep, Above Me The Wide Blue Sky. You’ll see it popping up around London soon. What do you think? Fevered Sleep, the critically-acclaimed company behind the upcoming Above Me The Wide Blue Sky, have created a stunning film about climate, migration and home called It’s the Skin You’re Living In. If you live nearby, pop into the Young Vic bar where you can watch an extraordinary mini-screen installation version of the film. Alternatively, you can watch it online. Above Me The Wide Blue Sky – where do you call home? We’re looking forward to welcoming Fevered Sleep back to the Young Vic with their extraordinary new installation Above Me The Wide Blue Sky. 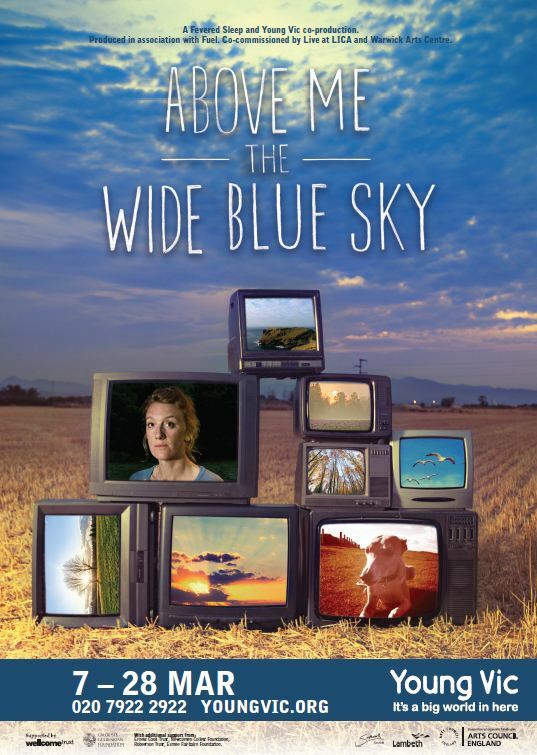 Staged within a multi-screen film installation, with a soundscape of birdsong, electronic music and a new score for string quartet, Above Me The Wide Blue Sky weaves together images, movement and sound with stories of love, loss and belonging from an ever changing world. As part of the development of the show, Fevered Sleep have traveled the UK to meet and talk with all sorts of people, in all sorts of places, to talk about their relationships with nature. The results are being worked into the unique narrative of the show – maybe you’ll find your story in there!